Welcome to the gangstertoursuk website terms and conditions for use. These terms and conditions apply to all purchases made through Gangster Tours Ltd whether online or offline. By accessing this Website and/or making a purchase you agree to be bound by the terms and conditions set out below. Gangster Tours Ltd offers a variety of tours, tickets and services through this website (www.gangstertoursuk.com) and through designated partner websites. Because our Terms and Conditions contain legal obligations, we recommend you to read them carefully. Unless otherwise stated, purchases made through gangstertoursuk.com or any other Gangster Tours Ltd affiliated website are subject to these Terms and Conditions; in all booking arrangements, the person making the booking shall be deemed to have accepted these conditions on behalf of the persons named in the booking. 1.1 All use of the web site www.gangstertoursuk.com ("the Site") is on the terms and conditions below. If you do not agree to these conditions cease use of the Site immediately. 1.3 By using gangstertoursuk.com or any Gangster Tours-affiliated website, you agree to be legally bound by these terms, which shall take effect immediately. 1.4 If you do not agree to be legally bound by all the following Terms & Conditions, please do not access and/or use gangstertoursuk.com or a Gangster Tours uk -affiliated website. 1.5 Gangster Tours may change these Terms & Conditions at any time by posting changes online. Please review these Terms & Conditions regularly to ensure you are aware of any changes made by Gangster Tours. Your continued use of Gangstertoursuk.com or a Gangster tours ltd-affiliated website after changes are posted means you agree to be legally bound by these terms as updated and/or amended. 1.6 You may not copy, reproduce, republish, download, post, broadcast, transmit, make available to the public, or otherwise use Gangstertoursuk.com content (inclusive of text, images, URLs, pricing information, etc.) in any way except for your own personal, non-commercial use. Any other use of Gangstertoursuk.com content requires the prior written permission of Gangster Tours Ltd.
1.8 Your use of gangstertoursuk.com or any Gangster Tours-affiliated sites is intended for personal, non-commercial use and/or to make legitimate requests to book the products or services offered. You agree not to use this site to make any speculative, false or fraudulent requests. You agree not to use robots or other automated means to access this site, unless specifically permitted by Gangster Tours Ltd.
4.1 Prices shown on Gangster Tours Ltd website are per person unless otherwise stated. 5.1 Gangster Tours Ltd accepts the following Credit Cards: Visa, MasterCard via Paypal. Payment may also be made to our Bank Account by Transfer on request. 6.4 The open top tour bus may continue to run during adverse weather and customers may be offered protection from the rain with Umbrella or Plastic Mac – provided for the tour by Gangster Tours Ltd.
7.3 Open Top Bus Tour tickets are not refundable. All sales are final, tickets cannot be exchanged or money refunded by Gangster tours ltd.
8.1 We want you to enjoy your experience with us. Sometimes however things do not go according to plan and if you feel that we have not lived up to your expectations, or that we could improve our service in some way. Please let us know by email info@gangstertoursuk.com and we will respond to you within 3 - 5 business days. 9.1 Customers purchasing tickets on this website will receive an e-ticket via Paypal. The Customer will need to print the e-ticket and bring the printed copy with them to present to a member of the Gangster Tours staff at the Customers preferred boarding point. 9.3 The Customer should present their e-ticket to a Gangster Tours member of staff, at the preferred boarding point. The PayPal eticket is also your receipt..
11.1 In the event that you miss your pickup time, please contact info@gangstertoursuk.com or telephone 07966 555559 who will assist your further. 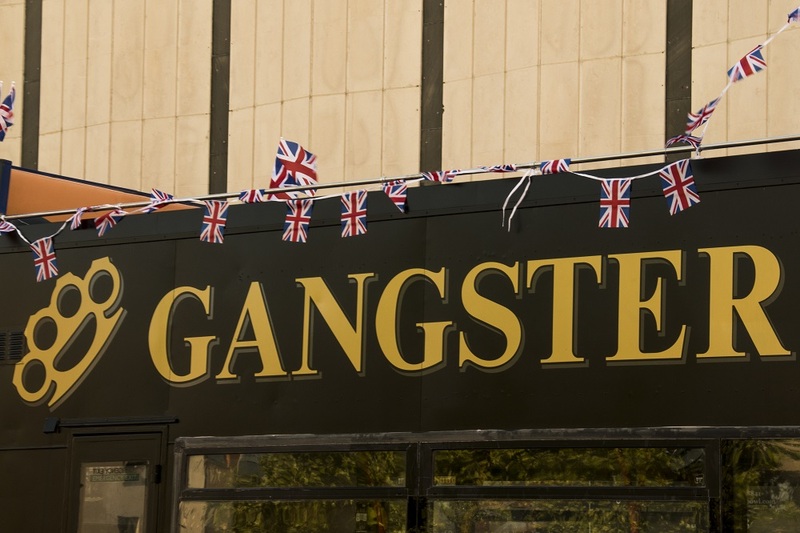 11.2 Drivers have to work under strict legal and time restrictions and therefore you will be dropped back at your starting location in London (unless stated otherwise during the tour or on our website www.gangstertoursuk.com). 12.3 We offer a range of snacks and cold drinks pm some tours. Care is taken to ensure nuts are not on the tour but we cannot be responsible if you come into contact with other peanut or tree nut-containing foods. Gangster Tours will not be held responsible for any allergic reactions..
12.5 Gangster Tours will not be responsible for any allergic reactions that may occur. 13.1 At Gangster Tours we do our best to give all our customers full care and attention, but we do need to know at the time of booking if there are any special needs or requirements. It is particularly important that we are advised of any disabilities and also if you intend to bring any specialist equipment such as a wheelchair with you. If you have a medical condition, please consult your Doctor if you are in doubt about your suitability to travel. 13.2 At Gangster Tours our policy is to maintain and improve the current standards of accessibility to our services for people with disabilities or whose mobility is impaired. We take into account the provisions set out in the Equality Act 2010 and whilst we encourage third party venues, and industry partners to adopt such measures we are unable to guarantee their standard of compliance. 14.2 Any items left on the coach or vehicle, are left at the owner's risk. Gangster Tours ltd will take no responsibility for loss or damage to these items. 16.1 Gangster Tours provides you with this booking platform, so that you can get in direct contact with the service provider and make a booking. 16.3 Gangster Tours is not a contractual partner for the booked service. You will be subject to the supplier's terms and conditions; Gangster Tours acts as an agent for the supplier of the activity. For further details please contact us.